In 1999 on my second wine tour in Chile, there had already been major changes since my earlier visit six years previously. The main Pan-American Highway no longer had so many chickens running alongside it, there were international-style service stations with good facilities and acceptable food and a few wineries boasted a public tasting room. However, I could never have imagined then the strides that the Chilean wine regions would make in terms of both wine quality and tourism over the next decade. Day trips to wineries on the edge of Santiago such as Concha y Toro or Cousiño Macul became a feature of tourism some time ago. However, it was the Colchagua Valley around 150km south of the capital Santiago that showed what could be done with a cohesive approach to wine tourism. They were the first valley to create a wine route with a central hotel and restaurant in the small town Santa Cruz to make sure that people could spend a few days in the area in comfort, and with around 12 wineries taking part in the scheme including Casa Silva, Mont Gras and Viu Manent. Today, several other valleys have followed their lead and there are now wineries with restaurants, tasting room shops and, in a couple of cases, very up-market accommodation. The Chilean wine regions are stunning with the Andes in view from some areas, and the ever-present coastal range mountains making for interesting topography. The Pacific Ocean is never more than an hour or so away and you can quite easily combine a wine trip with a visit to the Atacama Desert to the north or to the Lake District and volcanoes to the south, or of course add in some skiing or climbing in the Andes. For city lovers, Santiago has grown into a vibrant city with plenty to offer in terms of food and drink in particular. It’s still too early in the development of both the Chilean wine regions and Wine Travel Guides for us to offer guides for the independent traveller to Chile. However in the meantime, if you are an adventurous traveller and planning a trip there, Turisvino is a helpful new website that will help you plan winery visits to some of those mentioned above and other more recent stars such as Matetic, Casa Marin and Veramonte. On the site you can search nearly 30 wineries from wine regions including Ancocagua (with the inimitable Errazuriz winery), San Antonio, Casablanca, Maipo and Colchagua, find details about each winery and reserve tours or meals. Be warned, the Chileans are following the North American model for wine tourism and charging for tours and visits, but you should receive a fine welcome and good facilities for your money. To plan your trip you will need to go elsewhere for general information in particular about the wine regions and I would recommend using the Wines of Chile website. For news from the industry out there, check out Andes Wines or, if you read Spanish, Planetavino. It’s going to be exciting to watch the ongoing development of wine tourism in Chile over the next few years, and I really look forward to offering travel guides to all the Chilean wine regions some time in the future. 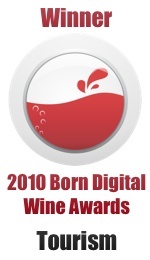 This entry was posted on Friday, December 19th, 2008 at 6:11 pm and is filed under Wine Tourism General. You can follow any responses to this entry through the RSS 2.0 feed. Both comments and pings are currently closed.